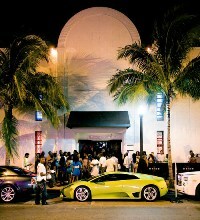 Over the years, South Beach has become less about big clubs where you can go and have fun and more about the VIP experience. I’m not sure why, as the quality of the clubs has gone severely downhill while the turnover has gone up. But bottle service and VIP seems to be the way Beach clubs want to go now. And, much as I love to rip on the douchebags, wannabes, and weekend all-stars who get bottles, I had actually not ever gotten one myself. So, in the interest of having a basis for my rants, a few weeks ago I did. A friend of mine had some family in from out of town who wanted to see a real, South Beach club. Not surprisingly, these family members were girls. So between me, him, his girls and a couple of other friends, we opted to split a bottle of champagne and a bottle of vodka at a club that will remain unnamed. The promoter we worked with was actually very nice and helpful, but unfortunately once she got us through the door we were forced to deal with actual club staff. Which was the typical Miami blend of rudeness and incompetence, with a dash of lethargy. After shelling out $385, which broke down to a seemingly reasonable $55 a piece, we were firmly told to “hurry up and stand over here.” And then forced to wait as our last friend was lectured by security that he had been told to “come along” and would have to wait behind the rope. Fortunately, the promoter informed security he had paid for a table, and was grudgingly let in. Now one would think that after dropping close to $400, the staff would be friendly. But then one would be forgetting one was in South beach. But how about at least getting your $250 bottle of so-so vodka to you in under half an hour? HA! We sat for a solid 45 minutes before a bottle came out. The mixers came out fast, as did the big tub of ice. So I sat drinking straight orange juice until about 1. “Welcome to South Beach.” She then promptly found some piece of Euro/South American trash in pants that were too tight to buy her a beer. At about 2:15, we were not so nicely informed by the staff that if we wanted to stay, we’d have to purchase another bottle at $250. All that money, and we don’t even get the use of the goddam table all night?! What a DEAL! Since the dance floor was minimal (in earlier incarnations of this club it was huge, but in VIP land all that space is now tables) and the drinks expensive, we collectively said “F—- this place,” and left. Some people try and justify getting bottles by going in large groups, saying it is economical that way. But we ended up paying about $18 a drink for weak vodka crans and some Ed Hardy champagne (no joke). Do it with less people, you may actually catch a buzz getting a bottle, but you also end up dropping $125 a person. Any way you look at bottle service, it is a losing proposition for you, the consumer. Do clubs really think we’re that stupid? That we’ll just keep dropping cash because we’re already in there listening to your D-list DJ? It’s a recession, morons. At the very least if you’re going to charge us an arm and a leg, let us get our money’s worth. If you’re coming to South Beach and want to do the big clubs, here’s my advice: Brink some flasks, fill them with vodka, pay the cover and order sodas all night. Because that, friends, is the only way you’re getting a buzz in the Beach without breaking the bank. "Bottle Service is for Douchebags and Suckers"
Why didn’t you name names? It’s not like you guys do business with the clubs. Name and shame. It’s how we roll on my site. Bottle service is actually a very good deal. It is the club that you didn’t like. You paid $55 per head and DID’T have to pay cover which would have been $30 or so. So for $25 you had how many drinks each? You didn’t have to wait on line, you had a couch to chill on for half the evening. This is a lot better than paying cover, buying a few drinks and not having a place to sit. Well Steve, that’s still an erroneous assessment of the situation. Matt mentioned a promoter, which if you really knew one would have gotten him (and especially his gaggle of girls) in for free. The only stipulation being, arrive early. It’s not even that hard to find promoters who will get you in without girls, the stipulation still being in that you come early. Hell I have three on facebook who send me free invites to all the clubs on South Beach every week. I also wanted to say, why are you going to a club on south beach to find a place to sit? Like others were saying, if you subtract $20 for the cover, then that’s about $35 for 3 drinks at a hot club in Miami and you can chill with your group. 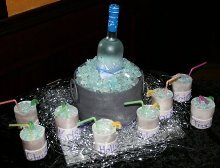 But I would have been pissed about waiting 45 minutes for the vodka to arrive. Outrageous. If you drank the drinks slowly, would they have booted you out? Excellent article to warn tourists of the pitfalls of bottle service. 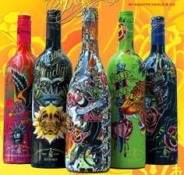 And Ed Hardy champagne-awful! Was it any good? The champagne actually wasn’t bad. And, no, had we nursed the drinks I think we’d have been ok to stay there as long as we still had the bottle. Kinda like a restaurant if you eat slowly. But that being said, I think I go out to drink more than dance or look cool or whatever, so something like this is probably wasted on me. POD - I didn’t name names because this isn’t an indictment of a single club so much as it is the practice of bottle service. So if I name a club, a reader might say “Well, it sucked at Club X, but I’ll try it at Club Y and see if it’s better.” No, the idea isn’t to cost a club business, but to maybe spark a debate and get clubs back to how they were 5-8 years ago. I.e. big, large dance floors and more focused on fun than exlcusivity. Yeah, bottle service pricing is ridiculous, and I also hate it that it seems that much of the club is taken up by VIP areas and the dancefloor has shrunk. If you’re trying to have a buzz and enter a club though, you definitely will not get one drinking solely in the club. You’re better off pregaming in your hotel room off your own liquor, or going to some of the bars in the area that serve reasonably priced drinks (and I know for a fact there are a couple good ones across the street from Mansion). Or, invest in some flasks as Matt suggested. Problem with the flask is that you run the risk of having it discovered if you aren’t covert when pouring it into whatever mixer you ordered at the bar. That’s extremely lame of them to make you buy more bottles. I’ll keep this in mind if I’m ever rolling with idiot friends who insist we do VIP/Bottle service. I’ll make sure they know that once the bottle is done we’ll likely be asked to give up our table… so instead of that, we’ll take it nice and slow. Hopefully no one reading this thinks that they will be able to buy cheap beer in the club all night. Nope. A bottle of Bud Light will probably run you $8. That’s the cheapest you get, it’s all uphill from there. Remember that these prices usually include 18% gratuity though. Look’s like P.T.Barnum was right all along….